, a printer at Gloucester, deserves notice here as the founder of that useful institution the Sun­Day School, and as a man whose character is to be praised for general4>enevoleuce. The live* of such men, however, seldom afford many particulars, and Mr. Raikes, living constantly at his native place in the regular employment of his trade, may be said to have passed his days in comparative retirement. He was born at Gloucester in 1735. 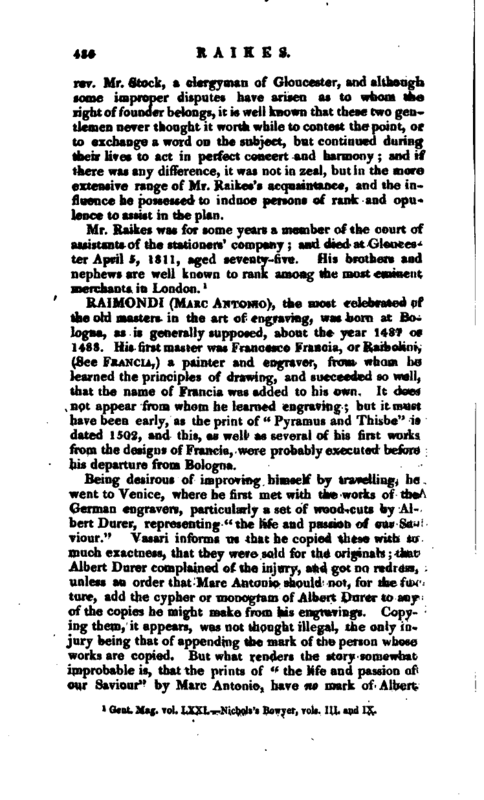 His father was of the same business as himself, a printer, and conducted, for many years, with successful merit, the “Gloucester Journal.” The education Mr. Raikes received was liberal, and calculated for his future designation in life, and at a proper age he was taught his father’s business, -which he carried on throughout the whole of his life with great reputation. Having prospered in the course of trade, he began early to look round for objects of benevolence, and first found them in the prisons. To relieve such, he employed his pen, his influence, and his property, and discovering that ignorance was the principal cause of those offences which render imprisonment necessary, he formed a plan of giving these unfortunate men moral and religious instruction, and regular employment, which proved highly beneficial and consolatory. But that for which he has been most highly and deservedly praised js the institution of the Sunday schools, which he planned in 1781, and which are now so common as to require no description. He comjnenced this benevolent undertaking in concert with the | rev. Mr. Stock, a clergyman of Gloucester, and although some improper disputes have arisen as to whom the right of founder belongs, it is well known that these two gentlemen never thought it worth while to contest the point, or to exchange a word on the subject, but continued during their lives to act in perfect concert and harmony and if there was any difference, it was not in zeal, but in the more extensive range of Mr. Raikes’s acquaintance, and the influence he possessed to induce persons of rank and opulence to assist in the plan.